I am honored to guest post for Courageous Mom in honor of Redeeming Childbirth. I am blessed by Angie’s vision to draw women to the Lord through their birthing experiences and unite Christian mothers. The good Lord has graced us with four children. Each birthing experience unique and each endeared me further to Christ. The privilege of motherhood has refined me and brought me greater joy than any other experience in life. Our first birth started with my water breaking at 3am and contractions never progressing. Cue the Pitocin and the extreme pain. I got an epidural when I was dilated to a 2-3cm. I pushed for about forty-five minutes and I didn’t exactly know what I was supposed to be doing. I couldn’t feel the contractions enough to know when to push. Finally, we experienced our first miracle of life. It was the most beautiful thing we had ever encountered. I sobbed tears of joy and cried, “It’s a miracle.” And it was. For our second birth, the doctor suspected my water had already broken again and I was admitted at 7am and put on Pitocin. The doctor came in around 10:00 to see if I had progressed. He broke my water at this time. I told the OB that I wanted to try to give birth without pain meds. 10 minutes later I quickly changed my tune and told him I wanted the epidural. He looked surprised as he left to order it. While he was gone the baby started making his way into the world. The nurse had to catch him, but not before I begged for some pain relief. She gave me Stadol. Had I only known how close I was to giving birth I would have refrained because it didn’t do anything for the pain, and made me feel peculiar. My Savior God to Thee. Indeed He is Great and as I looked at my little baby boy I sobbed uncontrollably and thanked the Lord for another safe delivery and healthy baby. By my third pregnancy, I was seeking to live a natural lifestyle. I was comforted by that verse. I memorized it and meditated on it. The day finally came and I labored at home. I waited until my contractions were 3 minutes apart, brewed a strong batch of Red Raspberry Leaf Tea, and then drank it as hot as I could stand it. We got to the hospital at 3:00pm and the nurses were skeptical that I was even in labor until one of them checked me. I was dilated to a 9.5! The baby was coming! I was surprisingly calm and felt the Lord was with me. The room was a frenzy with staff scurrying about and an administrator trying to get my information. A nurse attempted to administer a hep-lock, but before she started the baby began to crown! It was painful but I remember thinking it was not as bad as with my other labors. My husband’s arms enveloped me and the song “Leaning on the Everlasting Arms” was playing in my head. I hadn’t heard that song in ages and the only explanation I have as to why that song was in my head is that it was a gift from the Lord letting me know that He was with me. I pushed about 4 times and that baby was out! 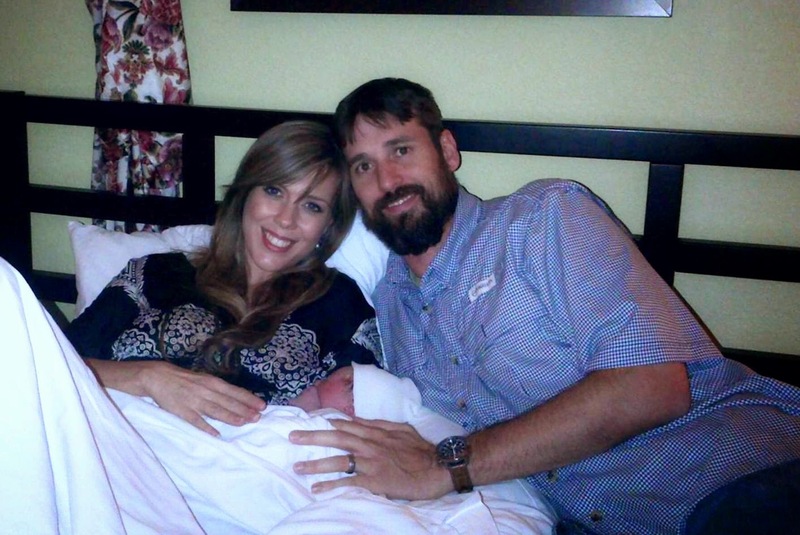 For our fourth baby, we chose to give birth at a birthing center. The birthing center had a luxurious Bed and Breakfast feel. I never felt rushed and my children were always welcome. I felt complete freedom during my labor. They gave advice freely, but were respectful of our wishes and gave us full control over our experience. As the day grew closer I began to get more anxious about the drive, even though it was just twenty minutes away from our home. The memory of my quick delivery with my last child was lingering in my mind and I was uneasy about arriving in time to give birth. The night before our baby’s arrival my husband said, “We should all go to the birthing center in the morning for you to be “checked”. I called ahead to inform the center of our arrival and our entire family loaded up and went in. I was dilated to a 4. We called my father-in-law and this sweet man and dear wife took our children back to our home. I was so happy to have our little family together in that birthing room as we prepared for the baby to come. I did draw strength from my joyous little ones that day. For this birth, I was not as concerned about any “method” although I did skim over my favorite Bradley Method book. I was more focused on drawing my strength from the Lord. It was more important to me to fill the room with worship music and Scripture so I could be constantly aware that the Lord was with me. My children traced their hands on the back of Scriptures and wrote love notes, which they lovingly placed around the room to encourage me during labor. My midwife concocted three herbal tinctures and put me on the breast pump to see if that would regulate my contractions. Indeed it did. Thirty minutes later my contractions became stronger and more regular. I was encouraged to have the midwife break my water. I was not ready to take this step, but as darkness began to fall, I decided it was time. Forty-five minutes passed and it was time to push. My husband called for the midwife and assistant. As they came in I asked if I should get into the birthing tub they prepared for me. One look and they knew there would be no time. I was in excruciating pain and I felt I could not go on. I remember crying out “Dear Jesus, please help me,” over and over, like a broken record. I was told the baby was crowning and to push. I pushed with every fiber of my being. Twice. Our baby girl was born and my cries turned to praise. I know the same promise is true for you, dear sisters. Draw near unto the Lord and He will draw near to you. Wishing you many blessings as you journey and draw your strength and joy from our Prince of Peace. I thank Sharon for sharing her testimony of God’s blessing and how He revealed Himself to her in all circumstances in all of her birth experiences! God is so good, all the time! And I want to challenge each of you sisters reading this testimony. Every time I have had a guest post her at Redeeming Childbirth, I receive emails of women disagreeing or judging the author who was willing enough to step out and share her personal and intimate experience of birth. I want to challenge you, sister. IF you found yourself judging this sweet sister because of her having an epidural, or if you felt judged because she chose to pursue natural birth in her fourth birth and you didn’t, stop right now and watch this video.